Nice pair of trunks. Denim look with white stitching that gives the illusion of pockets finished off with a white button. From early 1990s when I was a rail thin guy and could wear 27/28 waist pants, and my Ex's high-school pal worked for TODD OLDHAM (then Banana Rep. then Polo RL). Saved these super cool jams for my kids all these years, but they quickly blew past that size in their early teens! Per imballare utilizzo anche materiale riciclato. Also for multiple orders. Anche per ordini multipli. Suit has an inner waist drawstring. Marked Size 36. Waist : 31", stretches to 36". High waist. Side seam: 8.5". Baumwoll-Innennetz, kann noch gewaschen werden. Badehose Badeshorts. für Herren. Farbe : royalblau. original from the 70s. original aus den 70 er Jahren. Größe: ca. Color: royal blue. Oluba // Sporett. Oluba // Sporett. hel 22.03.18 . aus originaler DDR VEB Produktion. out of original DDR VEB production. mit Schiffenmuster. 70er Jahre. Farbe : grün, weiß, orange. (siehe Foto). made in Germany. elasticband at the waist. color : orange, green, white. Gummizug in der Tallie. size: 5 S / M.
Ausden 70er Jahren. tiefblau mit Glitzerfäden. swimming trunks. original from the 70s. Größe: 9 / XL. size: 9 / XL. intense blue with glitter threads. SCHIESSER trend. ausgefallene Badehose / Slip mit Frontfutter, ohne Innenkordel. Originale 90er Jahre Produktion. original 90s production. Länge: ca. 53 cm. Made in DDR. original 60s. There is one tiny spot/stain at the rear, see photos. Inside is very clean. There is an area on the inside front of the shorts that has what looks to read "Jerez" sewn into it. waist - 30". waist band to middle of rear leg opening - 8.5". VEB Strickwaren Oberlungwitz. schöne Badehose. Gummizug im Bund. made in GDR. made in DDR. beautiful swimsuit. side length : app. 23 cmleg scope : app. Size L Elastic w/ drawstring Waist fits up to 38" waist a bit snug. 36" waist ideal Fit. Red and dark blue. 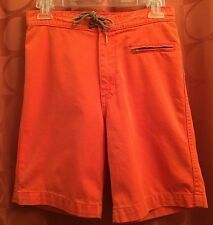 These are a pair of pre-owned vintage Speedo swim trunks shorts. These are a mens size large to extra large. I included a picture of the waist measurement. These are bright orange and purple colored. There is a small spot at the top of the short shown in the picture above. Please see all pictures for full description. Often for proper fit, hang, and wear ability, pieces will need to be altered and/or adding a hook or snap here or there, with a seam closure or strengthening needed. DATING TO THE 1940 ’S. FASHIONED OF A PALE YELLOW SATIN. These camo pants are in good shape, all zippers, buttons- drawstrings & velcro work properly. They are US Military issued, they have been worn but have lots of life left. This item is not in perfect condition. Excellent condition. Could be New. Aus 100% Dederon. 100% Dederon. original aus den 70er Jahren DDR. VEB Strickwaren Oberlungwitz. wunderschöne blaue Badehose. beautiful blue swimsuit. Schöne Badehose - Badeshorts. Farbe : dunkelbraun, weiß. kleine Innentasche. beautiful swimsuit. made in Western Germany. small inside pocket. elastic waistband. side length :app. Original aus den 70er/ 80er Jahren. SOLAR BADEHOSE. SOLAR - DORLASTAN. originale des années 70 / 80. MADE IN WEST GERMANY. Bundweite ca. 104 cm (gedehnt). ca. 70 cm (ungedehnt). Swimming trunks. side length :approx 23 cm. made in GDR. Any custom fee is your responsibility, check carefully before buying and having bad news! Per imballare utilizzo anche materiale riciclato. DIFETTI Nessuno. Also for multiple orders. Anche per ordini multipli. Rare Vintage Tommy Hilfiger - Tommy Trunks - Two Toned Big H Size Medium Signature Tommy Hilfiger around waist band Signature flag logo at waist Big H on left hip See photos for condition. If you would like to see more photos please let me know. Thank you! Original aus den 80er/ 90er Jahren. PALM BEACH Bademoden. SHINY BADEHOSE. 164/168, sehr dehnbar, wie S. originale des années 80 / 90. Bundweite ca. 96 cm (stark gedehnt). original from the 80s / 90s. NOT 100% SURE WHAT THESE SHORTS OUR MADE OUT OF, BUT THEY HAVE A SPANDEX/NYLON FEEL. COLOR: YELLOW/GOLD AND WHITE. Original aus den 70er Jahren DDR. wunderschöne bunte Badehose. original from the 70's GDR. schwarz-blau gemustert. beautiful swimsuit. blue-black motivs. It is based in the Hawaiian island of Maui. Colour :Bright Green and White with Fluorescent Neon Green - Hot Pink - Blue- Yellow. Original CERRUTI 1881 '80s sports, swimsuit, trunks, Mod. MADE IN ITALY. 84% POLYESTER, 16% ELASTANE. Men’s large / women’s xl How amazing are these shorts? have a pair of black bicycle type spandex shorts underneath elastic waist & drawstring antron nylon - Lycra spandex blend measurements are Approx & taken flat lay across the front not stretched waist not stretched 17” waist stretched 22.5” total length 13” total inseam 6” Vtg Mens Large JANTZEN Running Track shorts Swim Athletic USA Multi Color Shapes. Shipped with USPS First Class Package. Elastic waist is still stretchy but theelastic at the leg openings has lost it's stretchiness. color is a hawaiian print in several shades of blue. photos taken outside on the mannequin make the colors appear brighter than they really are.